Ted Takasaki: I grew up in the small town of Chatsworth, Ill., which had about 600 people. There I began a strange journey from the farmlands of Illinois to Minnesota to South Dakota, with a whole lot of fishing along the way. As a kid, my dad took me to farm ponds, fishing for bluegills and bullheads. 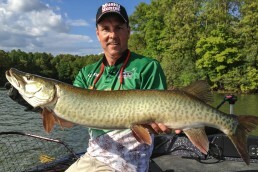 When I enrolled at the University of Illinois-Champaign, in the college of engineering, I met John Campbell, who reignited my love of fishing. During college, we’d go to nearby lakes to fish bass and crappie, and even made some trips down to Kentucky. Upon graduation, we both moved to the Chicago area to take jobs at Hewlett Packard. John’s family used to go to Okoboji and Spirit Lakes in northwest Iowa, and we began going for a week at a time, hiring guides. The first time we rented a boat, we went out and caught a walleye. We both looked at it and said, “Is this a walleye?” Later in my career, I focused on walleyes despite never having fished for walleyes until after college. MWO: I think you’re the only guys I’ve ever known who went to IOWA on their fishing vacations! Everyone else from Chicago went to Wisconsin or Minnesota. Takasaki: John’s mom was from Sheldon, Iowa—about 6 or 7 hours from Chicago to the Okoboji area. So it was a natural choice. MWO: At what point did you start thinking about getting into the tournament game? Takasaki: Well, we had just started our careers at HP. 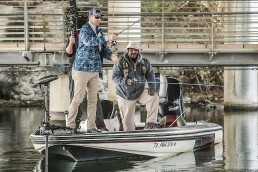 We scrimped and saved to get enough money to go on trips, took fishing classes from Spence Petros, editor of Fishing Facts magazine, for 7 weeks on Wednesday evenings. We subscribed to fishing magazines, went to seminars, and absorbed all we could. After a while we went to Andersons Lodge at Lac Seul, Ont. We caught walleye and pike—lots of fish—so we thought we must be pretty good at this game. MWO: Yeah, like you were the only guys who could catch fish in Canada! Takasaki: At the time (1989), the Manufacturers Walleye Circuit (MWC) had a stop at the Illinois River at Spring Valley, about 1 1/2 hours out of Chicago, Illinois. It was close, so we figured, “Let’s do it.” We bought a 16-foot tiller boat with a 50 hp, outboard, and took the plunge. To this day, I call it the “Mud Bowl.” Early that March, the area had 1 to 3 inches of rain, with stuff floating down the river. 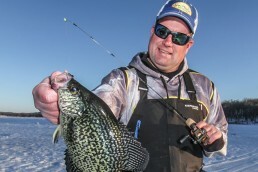 We caught a few walleyes in practice, but in the tournament, only 10 teams caught fish. We ended up tied for 11th place! 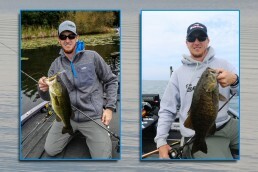 Despite that, we decided to fish one more event at Lake Muskegon, Michigan, a deep, clear water lake with a notorious night bite. Our ritual was to prefish or practice Thursday-Friday, fish tournaments Saturday-Sunday, and get back to the office Monday. 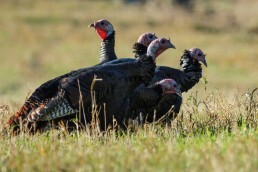 We didn’t know much more than rigging or jigging at the time—and didn’t catch a fish. 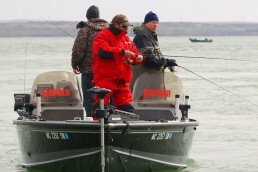 Maybe 30 of the 170 teams caught fish. We were disappointed, but not deterred. So in 1990, we decided to fish ‘em all. We qualified for the championship, and finished in 4th place. Actually, my father had passed away the day before the tournament at Dubuque, Iowa, so I missed the first day. 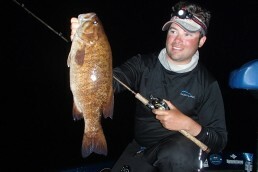 John fished the first day, but could only weigh 5 fish out of the 10-fish limit, even though he caught more. 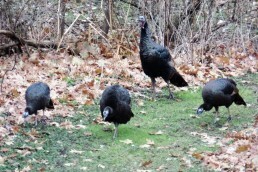 The next day, I showed up. After the third day, we wound up in 4th. Had I been able to be there on day 1, we may have been able to win, but that’s how it goes. We were still very happy and felt good about how we’d done. All this time, I figured I needed to find a way to get out of my real job and get into a fishing-oriented job. So I said that I can catch a few walleyes, can sell, and have a lot of good business experience. So he said I could interview for the job. And low and behold, I got it! So I promptly told my manager at HP that I was moving up to Brainerd. It was 1999. 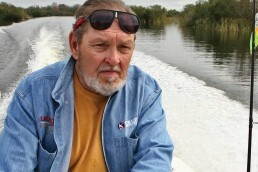 I ran the company for 10 years while simultaneously continuing my fishing career. We were very successful, doubling revenue and quadrupling profit. Part of my stipulation coming on was to become a shareholder. In 2008, the shareholders wanted to sell the company, fortunately prior to the stock market crash in October, 2008. If the due diligence had taken much longer, I would probably still be the president of Lindy. Takasaki: By that time, my sponsorships and speaking engagements were actually exceeding my president’s salary, so I was pretty confident that I could begin fishing full-time. So in 1999, I moved to Sioux Falls, South Dakota, where there’s no state corporate income tax, whereas Minnesota is a pretty high tax state. So I’ve been living there ever since. 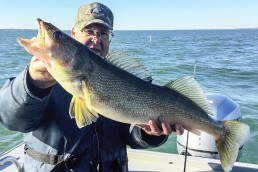 MWO: South Dakota is extremely walleye-oriented, with short drives to the Missouri River, and to other waters in Minnesota, or the Great Lakes. Takasaki: I love the town. Great people, no traffic, plenty of stores, a big arena venue for concerts. You can get pretty much everything you want, and keep more of the money you make. MWO: You are one of the most prolific seminar speakers I’ve ever seen. I seems like they keep you pretty busy. Takasaki: That’s part of the job title of pro fisherman. 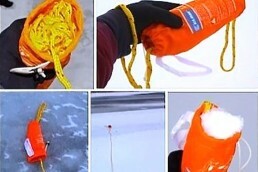 You have to communicate with anglers, at shows, on TV, go out with outdoor writers, get articles published. Educating: that’s how you publicize your name. 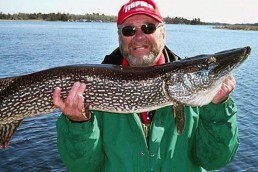 Back in 2003 I began working with MidWest Outdoors to help promote Lindy products. Back then, there really wasn’t any social media, so it was one of the best moves you could make. 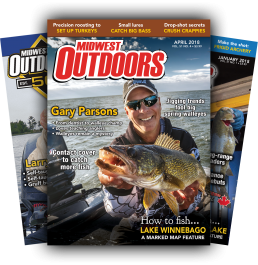 MWO: MidWest Outdoors is one place you can do both—publications and TV. With TV, you come right into living rooms. 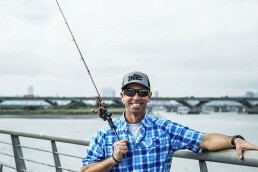 Takasaki: I think it’s establishing a contact with those people; I average 20-40 seminars a year, yet ask of all the anglers, and most come because they saw me on TV. If you have the skills and convey them, and your personality, it makes the difference. I wouldn’t be here if it wasn’t for TV. 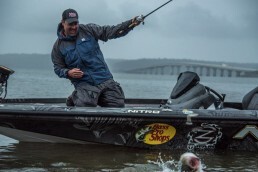 There’s more to being a pro angler than just catching fish. You have to be a communicator, salesman, justify your worth to sponsors by increasing sales, and then go out and catch fish. It’s not like being a pro golfer, who makes enough money off the tournament to make a living. In walleye fishing, you have to supplement your income by promoting products and being a good spokesman and salesman, in addition to being a good fisherman. One of the best pieces of advice I got was to keep your day job. 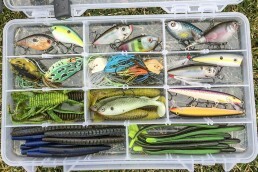 Treat your fishing business as a second job. Bring in revenue while you’re spending revenue, build your second job, and once it exceeds your day job, then it’s time to consider making a move. 1960s-70s Grows up in rural Illinois fishing farm ponds. 1979-82 Ted meets and forms friendship and fishing bond with John Campbell at University of Illinois—Champaign. 1982 Upon graduation from U of I College of Engineering, both take jobs with Hewlett-Packard in Chicago. 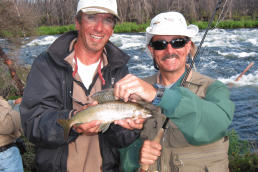 1982- Takasaki and Campbell begin taking fishing vacations in Iowa Great Lakes. 1989 The boys become tournament partners on the MWC Circuit. 1991 They win the prestigious MWC Team of the Year Title! 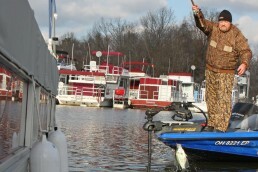 1991 Both begin fishing PWT tournaments at the pro level. 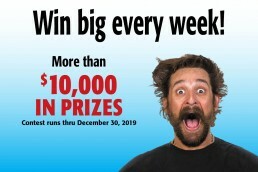 1998 Ted wins $100,000 at prestigious PWT Championship! 1999 Ted moves to Brainerd, Minn. and becomes president of Lindy-Little Joe. 2008 Lindy sells to new buyers, and Ted moves to Sioux Falls, South Dakota to pursue his fishing career. 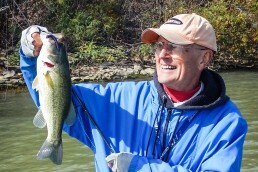 2010 Ted Takasaki is inducted into the National Fresh Water Fishing Hall of Fame. 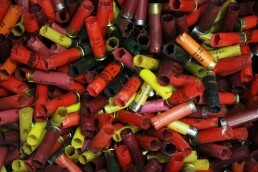 You’ll find it in the podcast section at MidWest Outdoors.com. On the bottom of the home page, look for the button that says Podcast, click on it and you’ll find the interview. 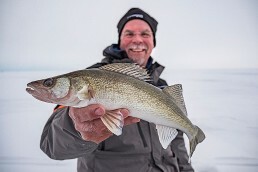 Look it up for March, where Ted Takasaki gives us the lowdown for finding and catch river walleyes and sauger in spring. Hearing is believing! 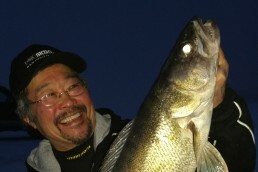 Young Ted Takasaki’s first walleye. Ron Lindner In his own Words: Coincidence, or Preordination? What Drove the Modern Fishing Revolution?